ELIMINATORS: The Comic Book Id Of Empire, Unleashed – Schlockmania! Empire Pictures tended to stick to straightforward b-movie premises of horror or sci-fi variety, the kind of films that could be made cheaply and host a variety of special effects that could be plentiful and colorful without breaking the company’s small film budgets. Eliminators was an interesting attempt to break the mold, venturing into more of a comic book/superhero-style realm. Though it didn’t have the budget to go all-out in a way that would truly fit the genre’s needs, the amount of success they have is surprising. 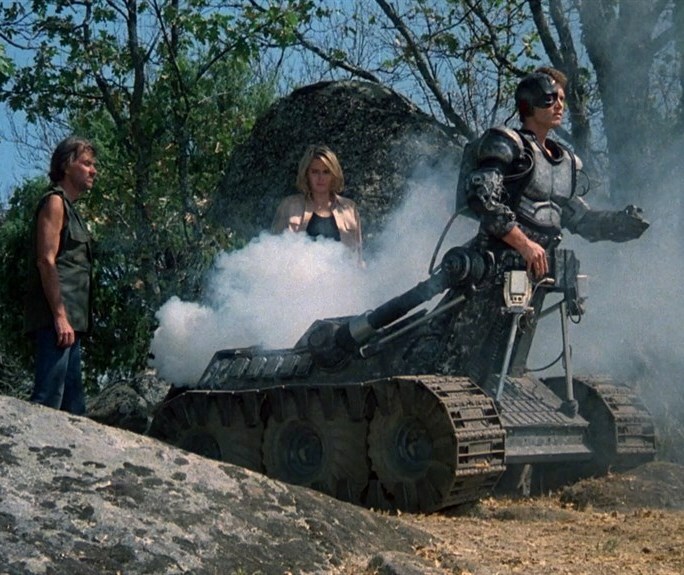 Eliminators begins with a cyborg called Mandroid (Patrick Reynolds) escaping the island lair of evil scientist Abbott Reeves (Roy Dotrice), who has been using him in sinister experiments involving time travel. 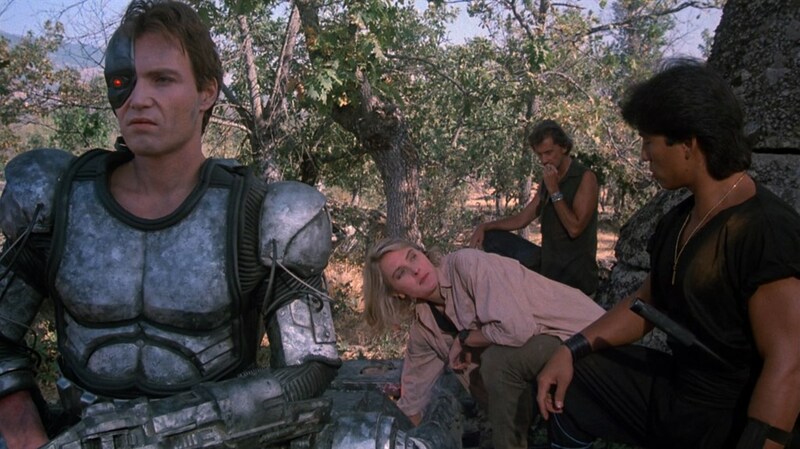 Mandroid doesn’t know his pre-cyborg identity so her turns to Nora Hunter (Denise Crosby), an army scientist who created the technology that Reeves stole for his evil purposes. The two team up to go after Reeves, enlisting the help of raffish island guide Harry Fontana (Andrew Prine) and later teaming with martial arts expert Kuji (Conan Lee), who has his own score to settle with Reeves. It all culminates in a showdown involving action, sci-fi and comic book plot twists. Eliminators is a favorite with b-movie fans who are into Empire Pictures because of its sense of fun and adventure. This spirit comes from the script by Paul DeMeo and Danny Bilson. They were two of the best writing talents to emerge from the Empire stable and they bring a sense of pulpy fun to the narrative, with simple but clearly-drawn characterizations and crafty plotting. The ambitions of their story ultimately overwhelm the resources Empire can give it, leading to a second half where the spectacle a bigger-budgeted film could have is missing and the denouement is too hasty to be truly satisfying. That said, DeMeo and Bilson’s work has a heartfelt love of its b-movie origins that carries it through. Director Peter Manoogian gives it a sturdy treatment that allows the storyline to be the star and he pumps it up with as much action and effects as the budget can allow. Eliminators also benefits from a strong, likeable cast of heroes. Crosby makes a resourceful heroine and Reynolds brings a sense of soulfulness you might not expect to a character that looks like an action figure brought to life. Hong Kong import Lee isn’t asked to do much acting but handles the martial arts sequences with aplomb, even choreographing them himself. That said, Prine is the one who steals the show, playing a kind of Indiana Jones/Romancing The Stone-type outlaw hero with charm and a nice sense of comic timing. To sum up, Eliminators is the kind of almost-classic where the viewer has to imagine what could have been if it had the budget to live up to its imagination but what actually made it to screen is still plenty of fun, a kind of blend of The Six Million Dollar Man, Frankenstein and Raiders Of The Lost Ark with a little bonus time travel and kung-fu thrown in to top it all off. If reading that description makes you smile, you just might have some fun with the pulp whimsy of Eliminators. Blu-Ray Notes: Scream Factory previously released this title in a full-frame edition on a 4-pack set for DVD but have just upgraded it to blu-ray via a two-fer disc that pairs this film with The Dungeonmaster. The new HD transfer is taken from non-remastered source so there is a bit of speckling here and there but the results generally look colorful and have a gentle but notable boost in detail. The 2.0 lossless audio retains the film’s vintage mix and gets the job done nicely. 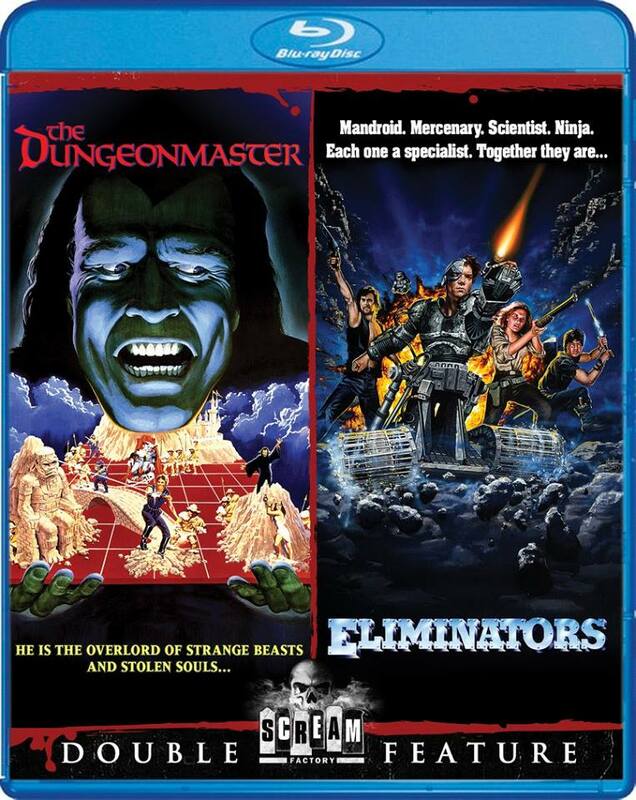 There are no on this part of the program but there is an interview with director Manoogian on The Dungeonmaster half of the disc (click here to read those details in the Blu-Ray Notes section of that film’s review).